The University of Southampton’s School of Education has played a major role in helping constructors Bovis Lend Lease win a contract worth £70 million to rebuild one school and carry out major redevelopment of another in the London Borough of Wandsworth. The University has given expert advice on the design of the new buildings and is helping to develop an innovative, exciting programme of teaching and learning for staff and pupils. “I believe it is the first time a university has been involved in advising on the redevelopment of schools in this way. We will use the considerable expert knowledge we have at our disposal to achieve an inspiring and creative environment for the teachers and children,” comments the School of Education’s Enterprise Officer, Keith Smith. “Keith Smith and his team from the University of Southampton played a key role in winning the Wandsworth bid and we look forward to developing the partnership across a range of school projects in the future,” says Chris Spiceley, Programme Director at Bovis Lend Lease. 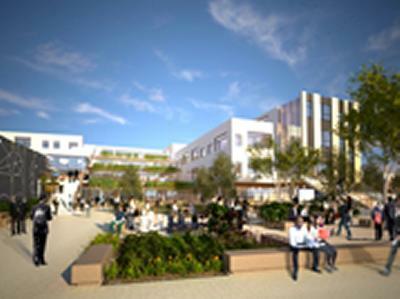 The rebuilding of Burntwood School and the major redevelopment of Southfields Community College will get underway early next year. During the bidding stage the University team advised on the design of the learning environments of these new buildings and is now working with the schools and Wandsworth Council to help develop a range of support, including leadership training and school improvement services. The construction phase of the project will take around two-and-a-half years, but the aim is that the University will provide support for staff well beyond this period with continued professional development. “From the start, Keith Smith and his team took a collaborative approach, based on thorough, detailed consultation with staff and creative sessions with students of all ages, to ensure what was developed was wanted and unique,” comments Headteacher of Burntwood School, Helen Dorfman. The University of Southampton joined forces with Bovis Lend Lease to form a consortium last year and successfully bid to become an approved supplier for the government body, Partnerships for Schools. It established and led a network of ten other universities to achieve a broad base of expert knowledge and education research. The consortium has since secured contracts to work on 16 schools in the Wandsworth area, but this has now been reduced to two, while a government review is carried out into capital investment in schools.